Cormous perennial with lance-shaped, twisted leaves and compact spikes of 4-12 white, blue, purple or pink flowers, with a green or brown, circled, central mark, in spring and early summer. [RHSE, Hortus, CECB]. A polymorphic species with many named colour varieties. [Grey]. ‘Flowers 5-10, of a firm substance, varying in colour from bluish purple to purple, yellow, etc. 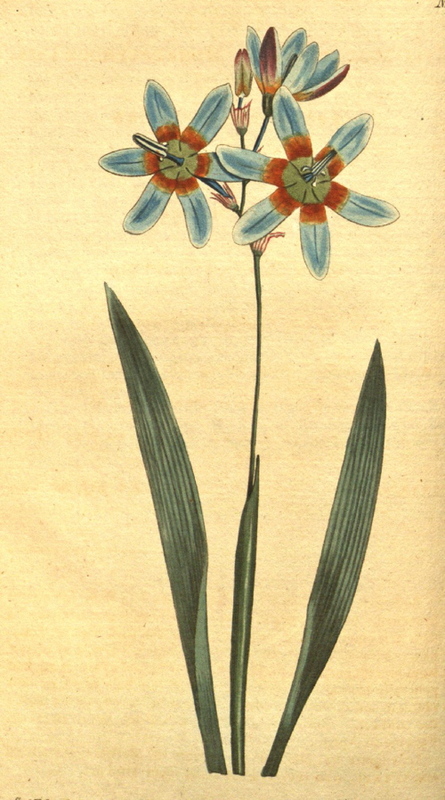 often variegated, and generally having a large red stain at the base more or less obsolete [meaning not fully developed] and of various tints.’ [BM t.607/1802]. Introduced to Britain in 1792. [JD]. The plant figured at BM t.1378/1811 as Ixia monodelpha beta ‘Orange-coloured Monodelphous Ixia’ is probably Ixia maculata L. which see. Listed in all published catalogues [B.282/1843]. First recorded in an Addendum to the 1843 catalogue. For further discussion of Ixias see Ixia hybrid ‘Calypso’.